After getting skunked in last night's KAP attempt, I looked on Google Maps this morning for a new and fresh spot to launch the Kite and camera. 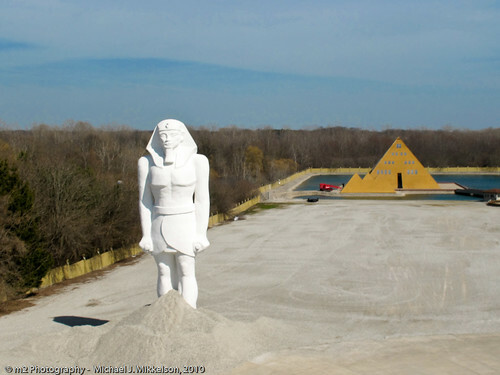 After browsing Lake county and a few Google searches, I came across an interesting piece of property known as the Gold Pyramid House. Once I saw the house from Google maps, I knew that I needed to go there for to capture some images. I called the number and talked with Jim Onan, the owner of this private residence, and asked for permission to come an take pictures from the kite. I think he was a bit skeptical at my technique, but was open for me to visit. I asked a friend of mine, Mac, to come along. He was essential in ensuring that the camera rig didn't crash into the ground, as the wind was really flukie today, ranging from 5 - 30 mph gusts. Jim was nice enough to give me a private tour of the King Tut's tomb, which is a scale sized replica of the one in Egypt, sarcophagus and all! I then launched the kite and attached the goPro HD Hero and the Canon G11 on my Gryo Stabilized rig. My bad luck from the previous day caught up to me, as the transmitter was dead, left on from the previous night. I tweaked the rig so that it would at least be flyable in a static direction and got them up in the air. 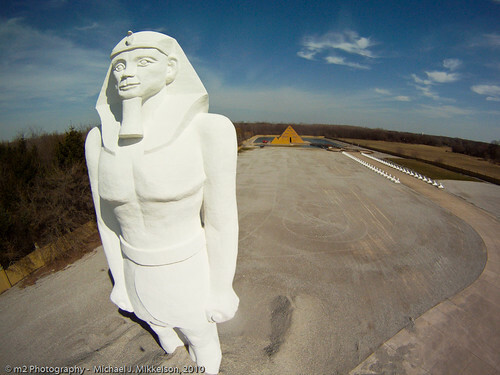 There is also a 60+ foot statue of Ramses, or King Tut, depending on which website you look at. 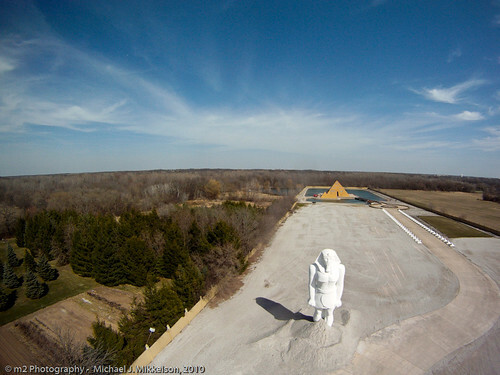 You can see the huge statue, with the Gold Pyramid House in the background with a line of sphinx statues lined up on the driveway leading up to the house. 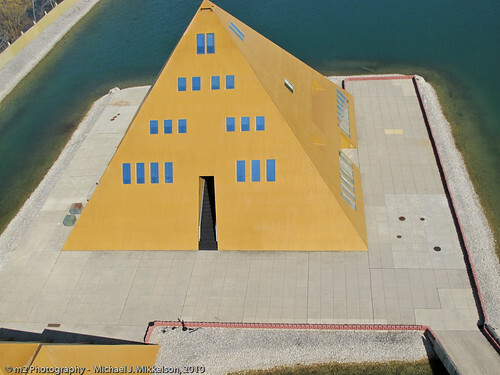 Here is the Gold Pyramid House, which is surrounded by a moat. The house apparently was plated in 24k gold at one point, but Mr. Onan explained that they made him change that to something that wasn't so shiny. After the KAP session was completed, I grabbed my regular camera to get some shots on the property. 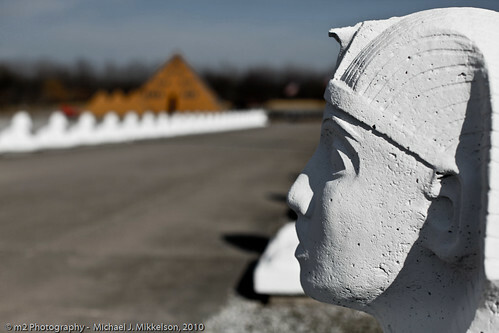 Here is one of the Sphinx statues that are lined up down the driveway. For additional images from today's session at the Gold Pyramid House, please visit the Gold Pyramid Gallery at the m2 Photography website. 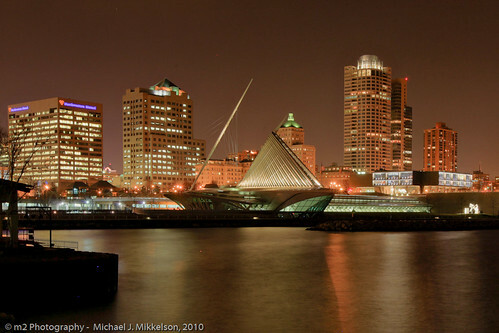 I drove up to Milwaukee last night to try and capture the Art Musuem and Milwaukee Skyline from my Kite Aerial Photography rig. Unfortunately, the wind did not cooperate. 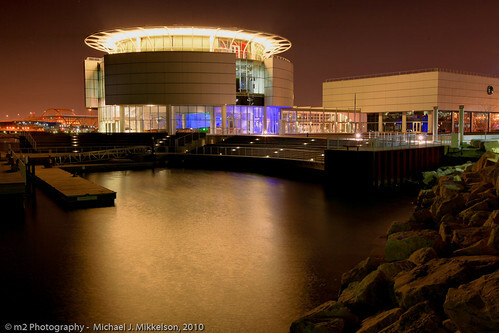 Instead, I walked out to the breakwater next to the Discovery World pier, and captured some images of the skyline. Each of these shots is bracketed with 3 images and combined with Dynamic HDR. 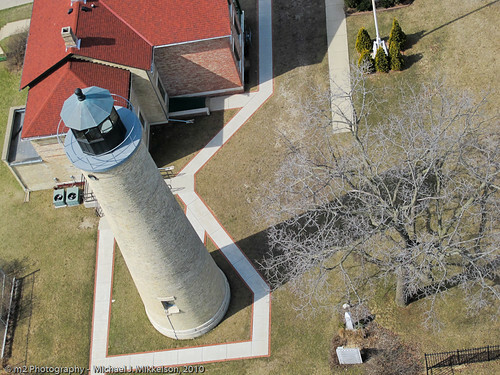 There was plenty of wind in the forecast today, so I packed up the KAP gear and headed down to Kenosha beach. 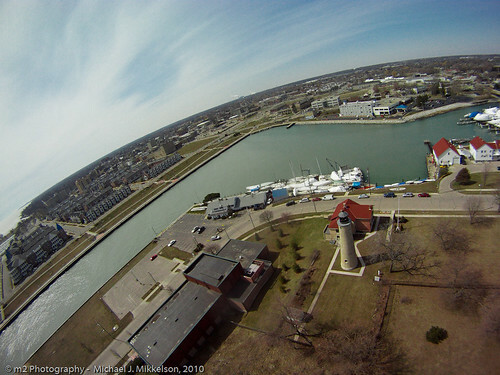 It was a rare NNE wind direction, and I have been waiting for a day like today to capture the Southport Lighthouse in Kenosha Harbor. I launched the flowform 16, which was slightly over-powered. It's still early spring, so the colors are pretty dull and brown, but was pretty pleased with the results from both cameras. 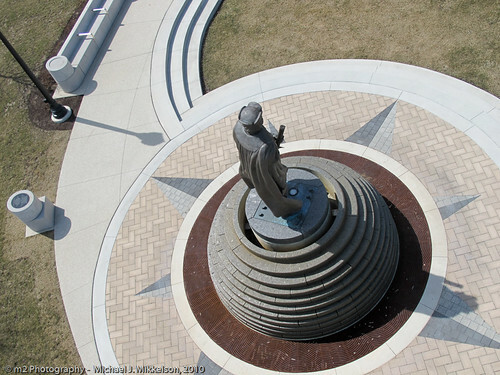 Here is a public water fountain with a statue of Christopher Columbus atop at Harborside park in Kenosha. 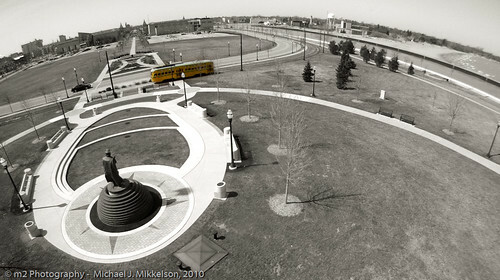 The main reason for me to try this a launch was the Kenosha Electric Streetcar. I waited for the trolley to come around, and was lucky enough to capture it a few times as it passed. I think that I need to go back with my Pole Aerial Photography rig and capture that downtown. 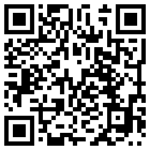 The Kite Aerial Photography forum has been a great resource for me in learning the in's and out's of KAP. I came up with the idea of creating a "best of" book, and let anyone who participates in the forum submit pictures. I just finished editing the book this morning. I use Photoshop almost exclusively, and didn't use the built in templates of Blurb. We had 18 users send in pictures for Volume 1 of the "Best of Kite Aerial Photography" book, and is posted on Blurb in 2 sizes, 7x7 and 12x12. I, of course, have an image in the book, which I captured in Mexico less than a month after taking up kite photography. You can click on the image below to preview the first few pages in the book.